Hello, my name is Billy and I'm here to tell you about my Class. I am called a bivalve because in the Latin language (the language scientists and doctors use) any word that starts with the letters Bi means two. Everyone in my Class has a twopart shell that is hinged together. These two shell parts are called valves. I open and close these valves by using my strong adductor muscles and ligaments just like you bend your elbow or knee. I don t have a mouth like you do; I have a siphon (like a short, fat drinking straw that feels like rubber) which I use to pull in water and tiny animals that live in the water, as well as "detritus" (i.e., little particles of organic matter from a variety of sources) . When this water enters my body, my gills take the oxygen out of the water and release my used up air back into the water. My gills also filter out the tiny food particles from the water and pass them on to my stomach where they are digested. I really don't have much of a head but I and a few of my cousins have many eyes; (see my picture at the beginning of the article) however, most of my cousins do not have any eyes at all. They don t need them because they live firmly attached to solid objects or live deeply buried beneath the sand or muddy bottoms of oceans, lakes or rivers and they don t have to see anything. Covering my soft body is a thin membrane called the mantle (like a thick piece of skin). The mantle takes lime and calcium out of the water and turns it into my twopiece shell. Some of my cousins have very, very tiny shells as tiny as half a millimeter (there are 24mm in an inch)!, while my biggest cousins have shells well over one meter (thirty nine inches) across and may weigh over three hundred and thirty kilograms (seven hundred pounds). Some of us have shells so thin and fragile that just picking them up will crush them while some others are so hard that you could jump up and down on them and they wouldn't break. Some are shiny smooth, while some are just like fingernail files or sandpaper. Some have sharp spines all over them to protect themselves so that fish and other animals won t eat them (example: Spondylidae the "spiny oysters"). Our shells come in every colour of the rainbow and some of our shells are so pearly on the inside that people often use them to make fancy buttons for their cloths. Our mantle can do one other thing that is very important to people. If a foreign object such as a piece of sand gets into our soft mantle, it HURTS, so we take the same smooth shelly material that we put on the inside of our shell and cover the offending object up and guess what! We ve just made a pearl. The longer we live, the bigger the pearl gets. If the pearl comes from one of my cousins who have the pearly insides on their shell, these pearls become very valuable; however, most of us just produce a pearl that is not very pretty or useful to man. Most of our families reproduce by laying millions of eggs into the water surrounding us. The male bivalves then release their sperm into the same water. If the eggs and sperm meet, a new baby bivalve is born. Some of my female cousins hold their eggs in a space called the mantle cavity in their body. The males still spurt their sperm into the water and when she pulls this water in through her siphon, the eggs are fertilized. These are then brooded inside her body until she knows they are big enough to live in the water. She then releases them into the water. All baby bivalves start life as tiny specks, (larval stage of growth) swimming in the water. When these larva become big enough, they start to settle onto their new homes. When they are still young, yet settled, they are called "spat". My cousins choose many different kinds of homes to live in or on. Some like to live attached to hard objects such as rocks or manmade objects. Some live all their lives buried beneath the sandy or muddy ocean, lake or stream bottoms. Some actually live inside wood. These cousins of mine used to cause man a lot of trouble when he used to sail in wooden ships. HE ATE HOLES IN THE SHIP and it often SANK. Some of my other cousins are parasites, meaning that they live inside a living host, such as a fish, and survive by eating part of the host. Some oysters may shed over one million eggs in a season. Only about one of these lives to adulthood. Some oysters alternate their gender. Male one year, female the next! 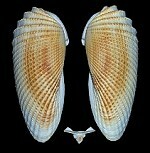 Some scallops (Pectens, or Pectinidae) have dozens of eyes. They help the scallop to see predators, so it will know whether to swim away or clamup! Adult Geoduck clamslive to over 140 years and reach a maximum shell length of 23 cm. Geoducks are among the longest-lived animals in the world. See: "Interesting Geoduck Facts" for more interestinf facts on this clam! Boring clams (Family Xylophagidae "wood eater" in Latin) can sink a ship! They are often called "ship worms", even though they aren't worms at all!! The largest known bivalve harvested was a Tridacna gigas which weighed 330kg (734 pounds), and was 1.4m (nearly four feet) in length! Most molluscs are capable of making pearls when foreign substances enter their shell. They coat the foreign substance with shelly material. Some clams can grow pearls as big as golf balls. The pearl industry is worth many Billions of dollars each year. Freshwater clams (family Unionidae) are often used as nuclei, around which pearls can grow small, round pieces of the clam's shell are placed inside a Pearl Oyster (Pinctada margaratifera Linne, 1758), and they are coated with iridescent nacre and form a pearl.